If you are nesting the little ones or empty nesters looking for that quiet spot near healthy restaurants, Beach Nest is the place for you! 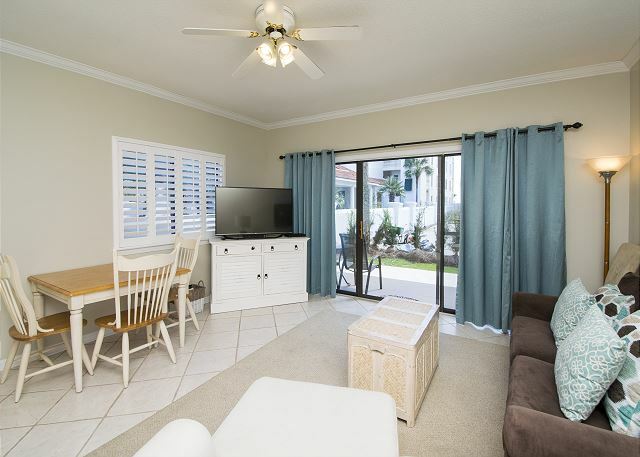 This adorable beachside condo is just 50 steps from the beach (from the back patio door to the sand) and just a short walk or bike ride to lots of shops and restaurants. 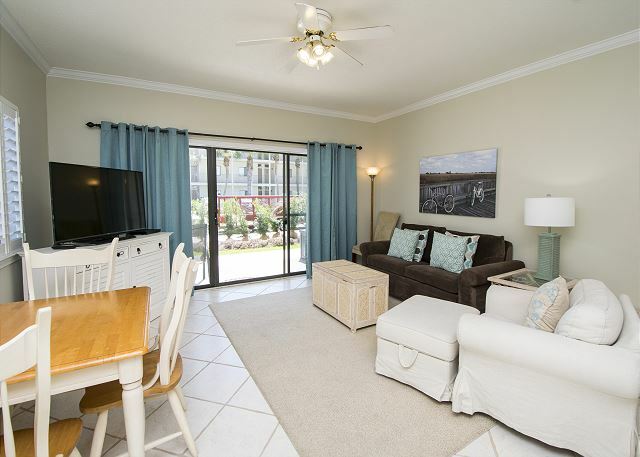 Accented in sea glass green with a new 49" flat-screen HD TV in living room, Beach Nest is a beautifully decorated quaint end unit on the ground-floor that lets you avoid stairs with the luggage, enjoy daylight from the windows, and nest right in the middle of Seagrove Beach. Local options are: 1 min walk to beach; 3 min walk to Bike Rental; 10-15 min walk to Cafe Thirty-A, The Perfect Pig (gourmet b/l/d), Donut Hut (amazing apple fritters), Goatfeathers Market (steamed shrimp and crab cakes to go), Cowgirl Kitchen (quaint b/l), Surfing Deer restaurant, 723 Whiskey Bravo (pub with burgers and grilled seafood). 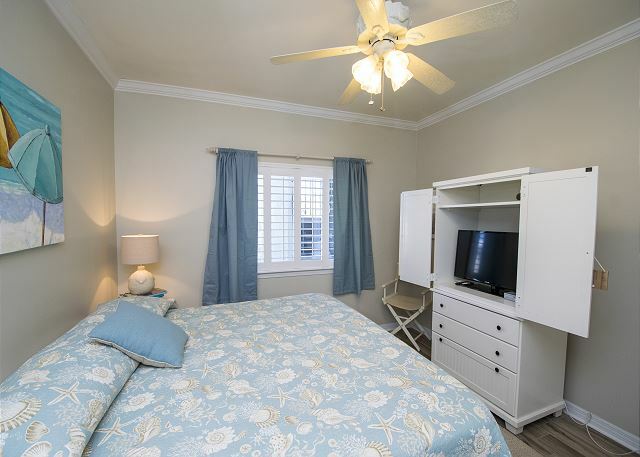 The master has an incredibly comfortable king-size bed, a 32" LED TV, and it's own private bath. There are bunks in the hall, a queen-size sleeper with memory foam in the living area and a second full bath. 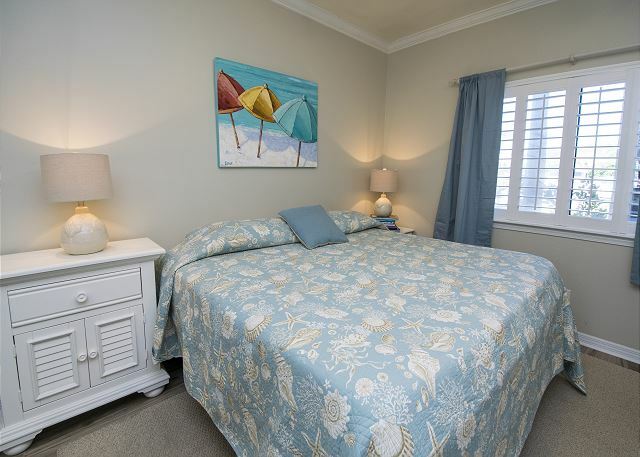 Six can sleep comfortably at night and then enjoy the beach all day!! 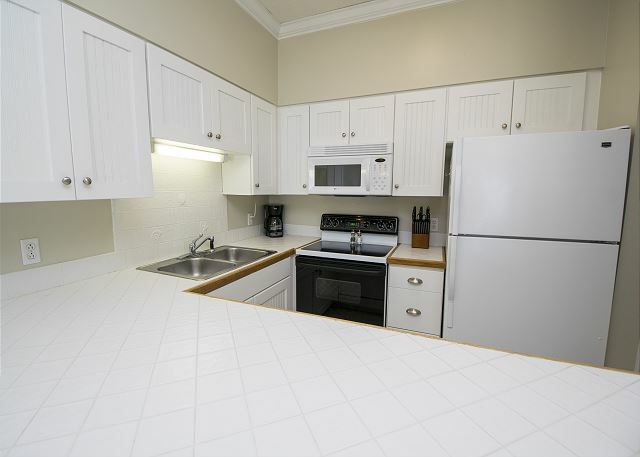 It was recently redecorated and painted, and we added brand-new kitchen cabinets. 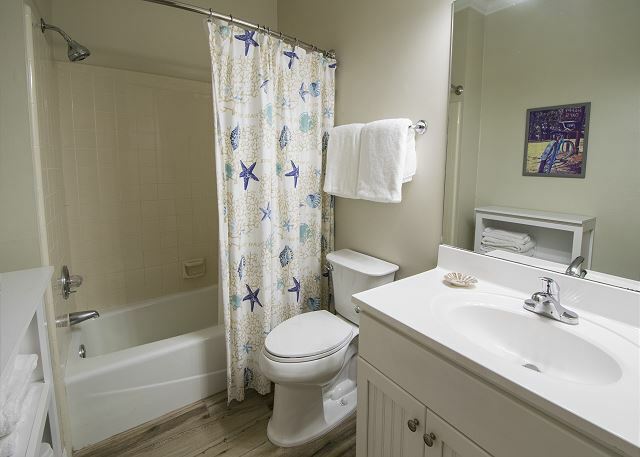 This end unit is away from the parking lot allowing more privacy. 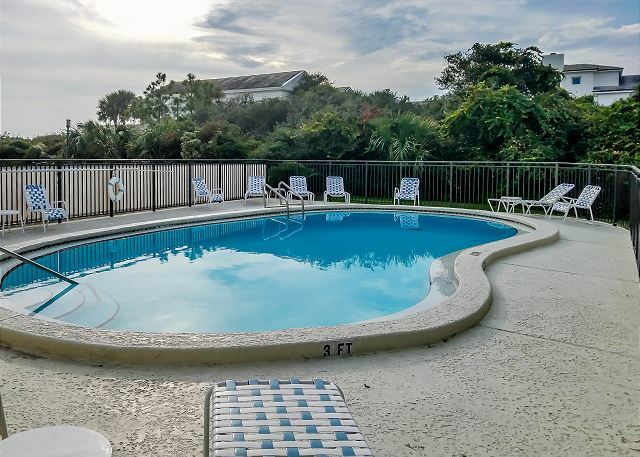 There is a beach walkover, pool and a BBQ grill only a few steps away. No pets or smoking. 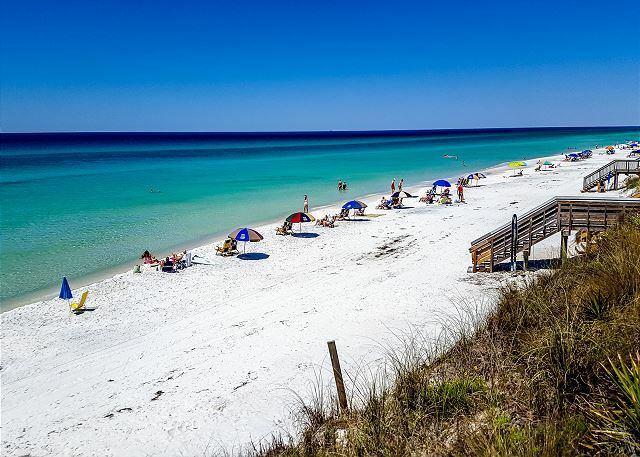 Seagrove Beach is a great vacation spot or everyone -- adults and kids! The beach is gorgeous! 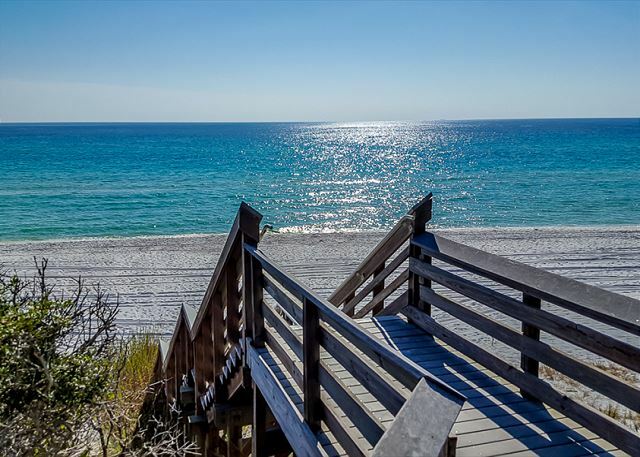 Aside from walking on the beach or playing in the pool, Seagrove and the area offer lots of activities including biking, kayaking, canoeing, tennis and golf. The 19-mile bike path along scenic highway 30-A runs just in front of the building. 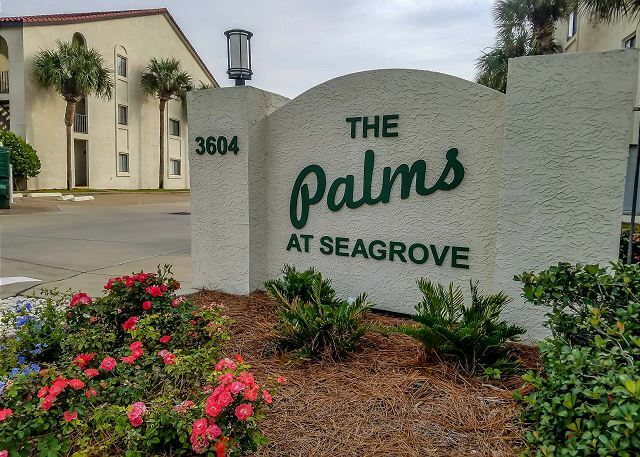 The Palms at Seagrove is only 1.5 miles east of downtown Seaside's restaurants, shops and amphitheater and the Watercolor Crossings Publix. Call or email for details!!! You will LOVE IT! Went down single and came back married! Last spring break with my highschool senior daughter...second spring break with my girlfriend and her family. This week was busy busy as we got married and took tons of photos. Our unit was great. Loved the feel and it had everything we needed. Thank you for your review! This is such a great, cozy unit! 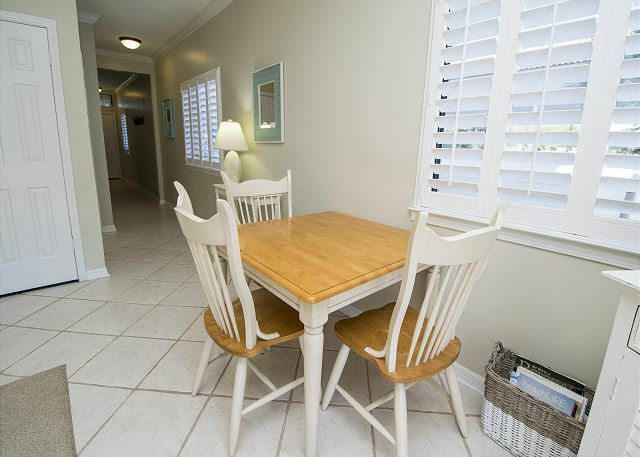 Looking for a clean, cozy place that is close to the beach where you can relax and soak in the sun? Look no further - you have found it! 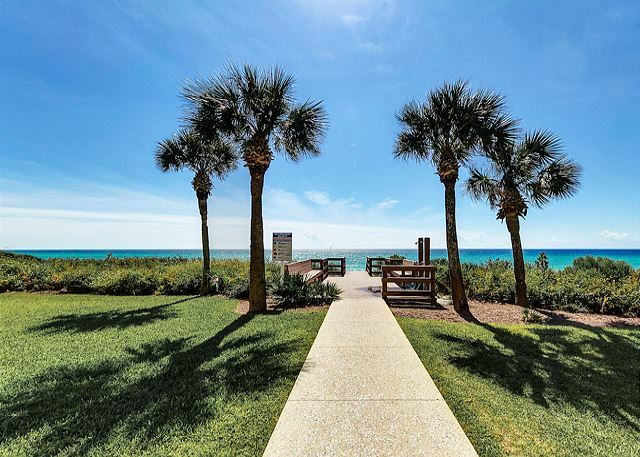 Beach Nest at the Palms is a little slice of heaven right on 30A! 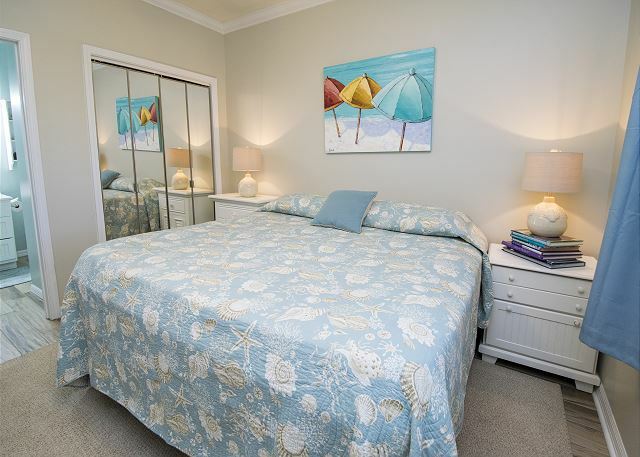 Great space if you need a few days away or if you are looking to spend the winter (and where else would you rather be than on the white sandy beaches?). Benchmark is here to help - call us today and we can find the perfect fit for you! Beach Nest was the perfect find! We had a great week staying at Beach Nest! Even though Tropical Storm Alberto kept us indoors for 2 days, it was cozy enough for us to enjoy the movies, games and puzzles they provided for us. 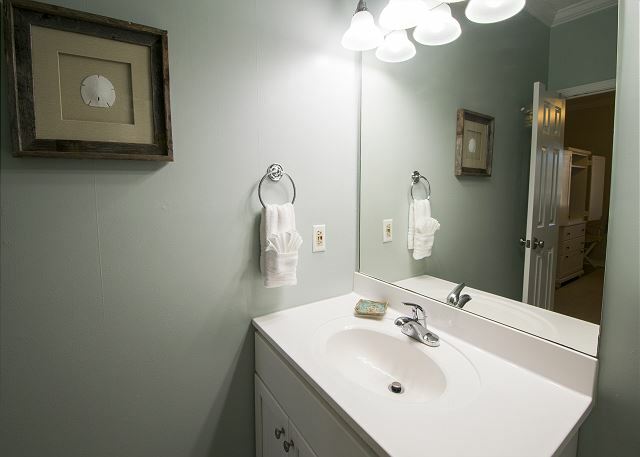 Having 2 bathrooms was a huge bonus for our family of 4. Most 1-bedroom condos we have stayed in previously only had one bathroom. We were so close to the beach- we could see the ocean from the edge of the back porch. There was a nice storage bin on the back porch to keep all of our beach gear. They even had their own chairs and boogie boards we could use. The bed was very comfortable as was the living room furniture. We would definitely stay here again! Thank you for your review - and we would welcome you back anytime! 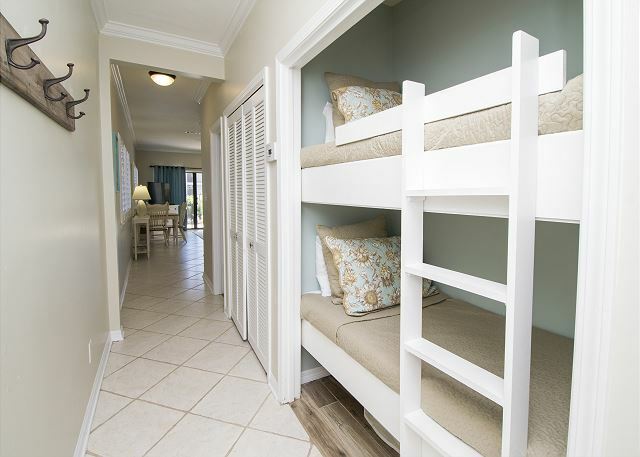 We couldn't agree more - this is a fantastic unit for a family to enjoy a beach vacation. 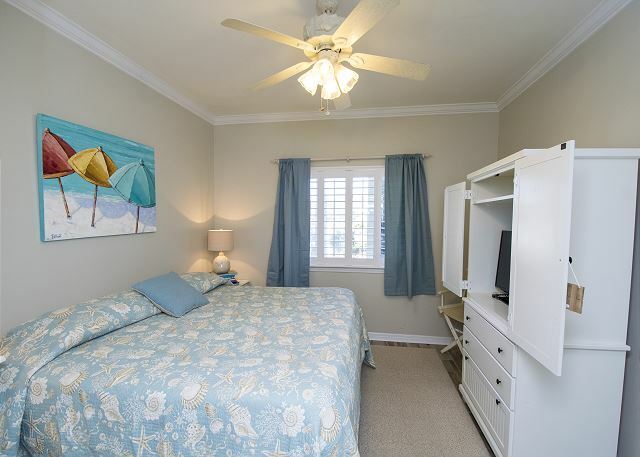 So very close to the beach and all the amenities you could ask for in this home away from home! And while the weather does not always cooperate for a day at the beach we are glad you took advantage of the games and puzzles the owner so thoughtfully provides for you - makes for some great family memories! 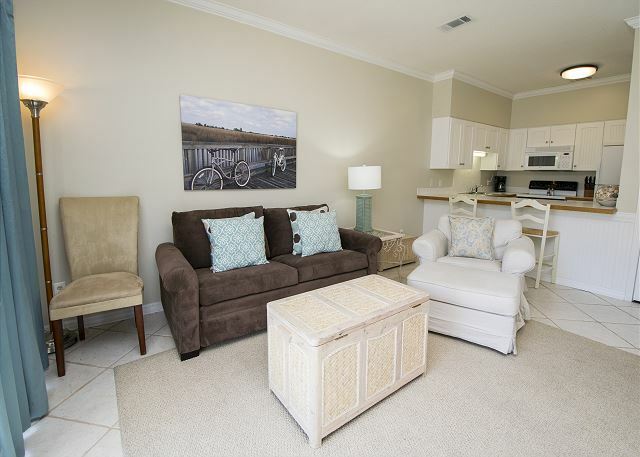 Time to make your own family memories at the beach - call us today! My retired husband and I spent a week here and it was very restful. The unit is quiet, dark in the bedroom at night, and the mattress very comfortable (and I'm picky). It was a great location except it's not on the front of the units and did not face the beach. I was disappointed at that and didn't understand from the description. Thankfully the walk across the parking lot was easy for us (ages 73 and 82), so overall it was a good experience. The maintenance person had to let us in when we arrived because the door lock keypad didn't work. He was very accommodating. Thank you for submitting your review! We do apologize if there was any misunderstanding of the location of Beach Nest. 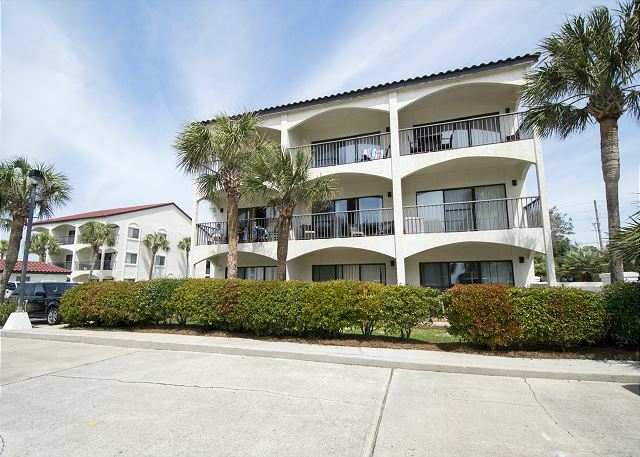 This unit is beachside but there is another condo building behind it that does face the Gulf. As you said though it is a very easy, quick walk directly back to the beach! 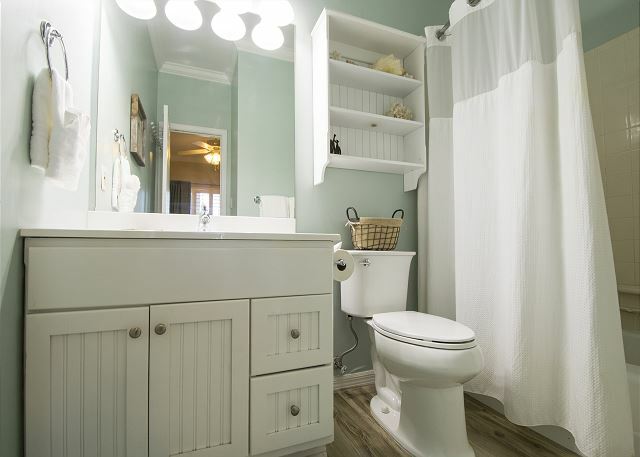 This is such a nice, comfy unit! 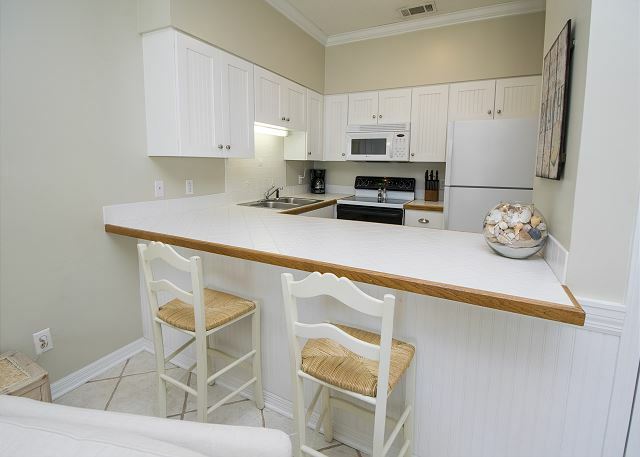 It is also located right in the heart of Seagrove Beach - very close to Seaside and just a short drive to Rosemary Beach! Everything you could want in a cozy little package! 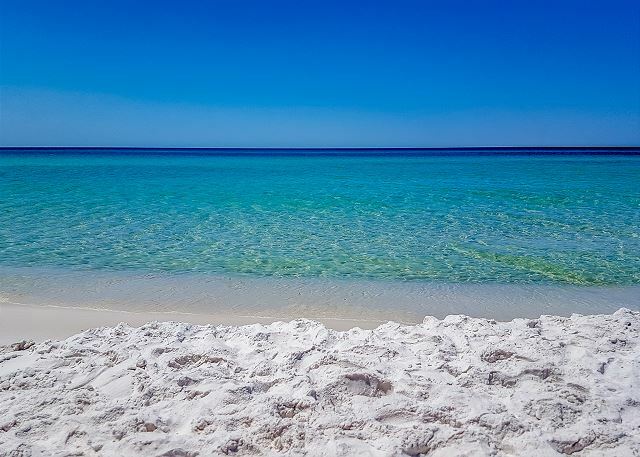 Call us today to get your beach vacation scheduled! 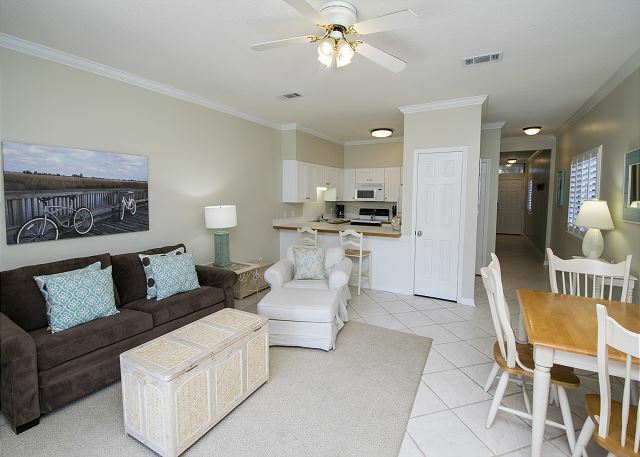 This unit was in the beach side of highway 30A which was easy to get to the beach. However, we never got a code to enter the beach or the unit. We had to call for both. This unit was one bedroom and adequate for the 2 of us. It was on the bottom floor so convenient with our luggage. This building did not have an elevator so thankful for the bottom level. Thank you for submitting your review! We do apologize for any inconvenience that we might have caused with the codes! We have updated all information that is given to our guests so it should be smooth sailing from here on out! 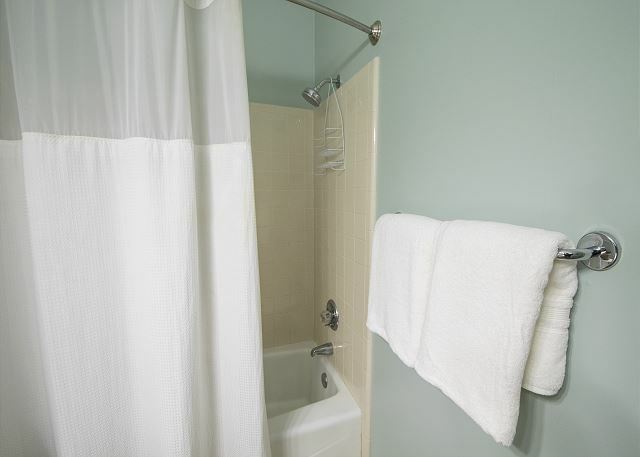 This is such a great unit - so clean and comfy!! The owner takes great pride in making sure everything is nice for all of our guests. The location to the beach is hard to beat! 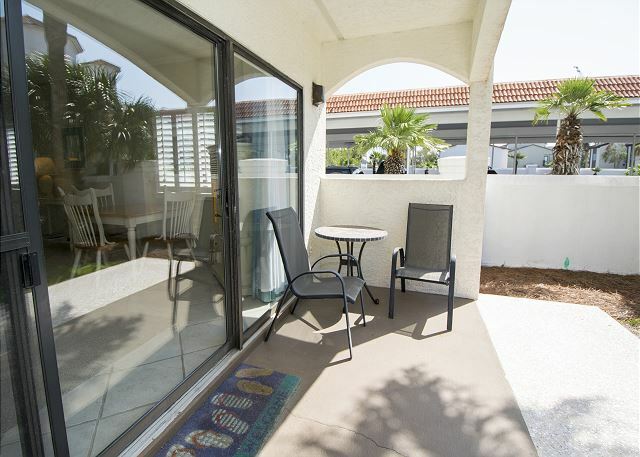 It is on the beachside and just a very short walk right to the pearly white sands! 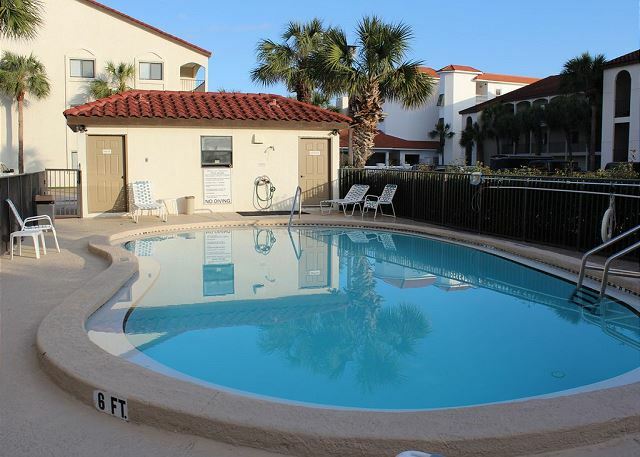 When you need a break from the beach come on back and enjoy the pool! Give us a call soon as this one won't last long! THE WEATHER IN JANUARY AND EARLY FEBRUARY WAS COOLER THAN NORMAL, BUT THE LAST 3 WEEKS OF FEBRUARY WERE WARMER THAN NORMAL. HAD A TERRIBLE EXPERIENCE THE LAST FEW DAYS OF MY STAY. THERE WAS A FIRE IN CONDO D4 DIRECTLY ABOVE D1 AND THE NOISE FROM THE DEMOLISHION WAS ALMOST UNBEARABLE. HAD TO LEAVE 2 DAYS EARLY. BUT STILL HAD A WONDERFUL TIME. Thank you for taking the time to submit your review! We are sorry about your experience given the fire - it was truly an unfortunate experience for all involved. We do wish that had there been something more we could have done for you that you would have contacted us. It is important to us to ensure that you have the best experience possible while you are visiting with us! We will keeping an eye on the remodeling and soon all will be back to normal! 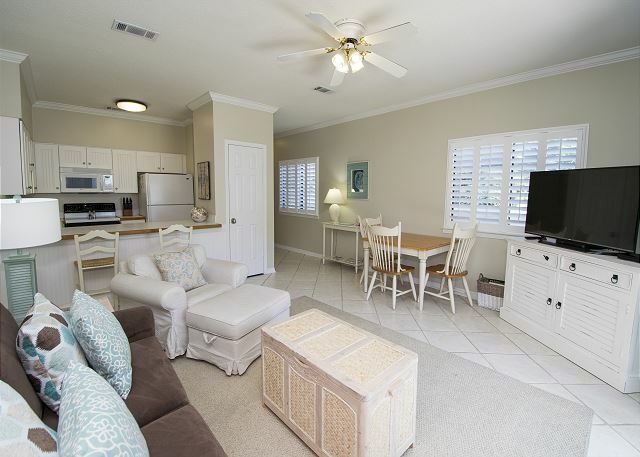 This condo is a great place to stay along 30A - it is well equipped, very comfortable and very close to the beach! We hope you will join us again!